When the summer months come, and your kids have vacation from school, you'll start to wonder what they can do to keep busy and yet still have fun. You probably wouldn't want them sitting in front of the TV or playing computer games the whole day. If you have a backyard with enough space, a swing set is a great way for the kids to play safely and get some fresh air. 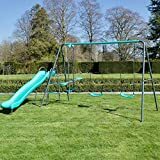 They can include a lot more than just swings: they can also have a couple of slides, monkey bars, a see-saw, and a patio for other activities. But you will have to consider if it's worth the investment. You'll want a durable swing set that has enough activities to keep them interested for a long time. 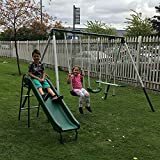 Here is a guide to some of the best swing sets on the market. 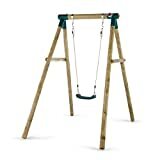 Wood Swing Sets: A wood swing set is strong, but needs occasional maintenance. You'll have to tighten any nuts and bolts, as well as stain and varnish the wood from time to time. 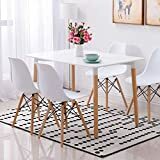 Good quality wood will not have the problem of splintering over time. Pine is an inexpensive wood, but has the problem of decaying and splintering quickly. The better choice is cedar—some companies treat the wood to make it resistant to decay and insect damage. Some sets are wood coated with vinyl—this eliminates any need for varnishing the wood. 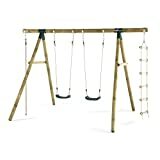 Metal Swing Sets: Metal swing sets are durable and don't require the maintenance that the wood sets do. 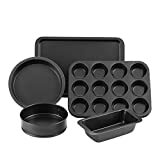 But they can get very hot in the summer, if the parts sit in the sun for a long time. 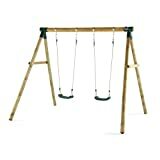 Plastic swing sets: A plastic swing set takes a minimum of maintenance. Usually the setup is easy and the parts are light—all you need is a hand drill to construct the swing set. But it might be difficult (or even impossible) to repair—if something breaks, it might require replacing. Adding extra things: Check if you can add extra swings, slides or monkey bars. 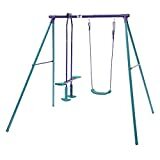 Some units are designed very specifically for the number of swings and slides. 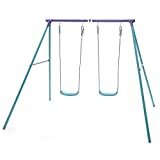 As for the swing itself: Typically you'll be able to switch from one type of swing seat to another (for example, a belt seat, or bucket seat that can secure a toddler). Also, check the weight capacity—what total weight can the unit tolerate. There should also be an age limit on the set: what is the minimum age for a child to be on the swing set without adult supervision. Maintain a safety zone around the swing: You should prepare a safety zone around the swing set, to provide padding against any children falling or tripping. (Or just landing safely when they slide down a slide or jump off a swing.) It's recommended to keep a 6-foot area around the swing set which is padded with rubber mulch, a sandbox, pea gravel, or wood mulch. Number of accessories: Some swing sets offer a lot more than just a swing. They'll also include a wavy slide and a tube slide, a climbing wall, and a sort of “patio” that shelters the kids from the sun, with all sort of other activities. Lifetime—was founded in 1986, making home basketball courts. They expanded to making picnic tables and furniture, sheds, kayaks, camping equipment, and playgrounds. Their headquarters is located in Clearfield, Utah. Swing-N-Slide-- is located in Janesville, Wisconsin. They were established in 1985 as the first do-it-yourself playground manufacturer in the United States. They make easy-to-build slides, swings, play sets, and accessories. Gorilla Playsets-- is a manufacturer of pre-cut, pre-sanded, and pre-drilled wooden playsets. They have been operating since 1992, and their headquarters is in Canton, Georgia. Their sister companies (PlayNation, Planet Playgrounds, and PlanIt Play) also make slides, sandboxes, swings and see-saws from wood. Big Backyard-- is a brand of the company Solowave Design. They are located in Waterloo, Ontario, Canada. Solowave Design is an innovator in designing and manufacturing ready-to-assemble outdoor living products, for leisure and play.